A hiking accident might have left actor-comedian Jay Cramer partially paralyzed, but he’s not stuck in neutral, thanks to the OT Driver Rehabilitation Program at Rancho Los Amigos National Rehabilitation Center. Lying there facedown in the cool canyon water, Jay Cramer didn’t quite feel right. It’s not like falling from the boulder’s face into the hip-deep water below was a new experience. He had taken spills twice before as he and his buddies slowly traversed the rocky landscape in Malibu Canyon that Tuesday morning. But something felt different about this fall. When Cramer, then 30 years old, tried to roll over on his back, he discovered he couldn’t. His arms and legs no longer felt like they were his own. “Your whole life changes in the blink of an eye,” Cramer says. It was supposed to be a day of celebration. Cramer, an actor-comedian who had moved to Los Angeles seven years earlier to pursue stardom, had found out he was a semi finalist to be a contestant on Survivor. In anticipation of the adventure ahead, he and his friends had set out to get him prepared for a spot on the CBS reality show with a bouldering excursion. Bouldering is a style of rock climbing where climbers do not wear safety harnesses because they are typically no more than 20 feet off the ground. It hadn’t been the distance he fell that had caused Cramer’s immobility, though. “As I pushed off the boulder, I tried to do a backwards double jack knife off the rock,” Cramer says. That push-off caused him to hit his head on a rock in the middle of the water. The impact immediately shattered his fifth cervical vertebrae, the corresponding nerves of which control arm and hand movement. Cramer was airlifted from the canyon and underwent a grueling, nine-and-a-half-hour surgery to repair the damage to his body from the fall. When he awoke, he was surprised to see 14 of his friends had stayed the night at the hospital, anxiously awaiting any updates on his condition. Unable to speak, Cramer indicated to his visitors he was OK.
Now 39, Cramer gets around with the help of a power wheelchair and a retired service dog named Goliath. During his time at Rancho, the affable Cramer made fast friends by falling back on his characteristic humor during tough times. Exactly four months to the day after his accident, Jay landed his first stand-up comedy gig, and it was a hit. The experience and positive audience feedback inspired him to sign up to do even more stage appearances, which required him to travel from Burbank, Calif., to Hollywood, Calif., two to three times a week. It’s one thing for an actor to sit in traffic every day traveling to appearances, but quite another when you have to depend on others to get you there on time. While Cramer was very grateful for the Access van, his dependence on it often made him miss stage time or kept him waiting for rides long after the shows. One day while waiting for a ride, his buddy suggested Cramer should get his own car. Cramer knew that if he wanted to continue to pursue his passion he would need to get his own car to regain the freedom of coming and going at his own will. With the help of several grants, Cramer was able to save enough for the down payment on a navy blue Dodge Caravan. For someone with a disability to drive safely, a vehicle often has to be outfitted with wheelchair lifts, hand accelerators and brakes or pedal extensions — all dependent upon the driver’s condition. It means learning a whole new skill set. For example, someone with a right foot amputation due to diabetic neuropathy must learn to brake and accelerate with their left foot. For someone who has lost use of both legs — like Cramer — it can mean learning to accelerate and brake with your hands. California’s Department of Motor Vehicles advises people with disabilities to undergo proper training before getting behind the wheel. DMV specialists conduct interviews and screening evaluations before giving clearance for an on-road and written exam. The process has to be repeated every five years. 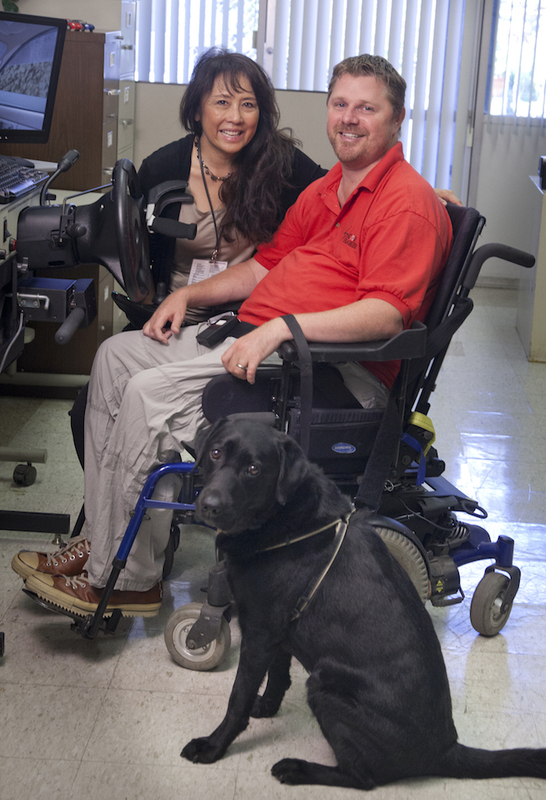 To prepare for his driving test, Cramer decided to connect with Sandra Okada ‘79, MSG ’88, CDRS, a certified driver rehabilitation specialist. Okada has been working at Rancho for the past 25 years, 18 of which she has spent with the OT Driver Rehabilitation Program. She understands the need for the driver rehabilitation program to get people back on the road. The driver evaluation and training program has been assisting patients in becoming safe drivers since 1957. The program offers a pre-driving screening and education, behind-the-wheel courses and assistance with DMV preparation, as well as with vehicle modification evaluations. Would-be drivers can gain valuable experience behind the wheel of the program’s driving simulator, which allows users a video-game type of immersive experience using some of the typical car modifications made for a handicapped driver. With three simulated screens facing them in wrap-around fashion, drivers are challenged by adverse weather conditions like rain and fog and can choose various surfaces like mountain roads and freeways to improve their skills. The experience increases their confidence behind the wheel without presenting any of the associated risks of an actual on-road encounter. Once they get comfortable with the simulator experience, they hit the roads around Rancho with occupational therapists in the car behind them, noting further adjustments necessary for a safe driving experience. 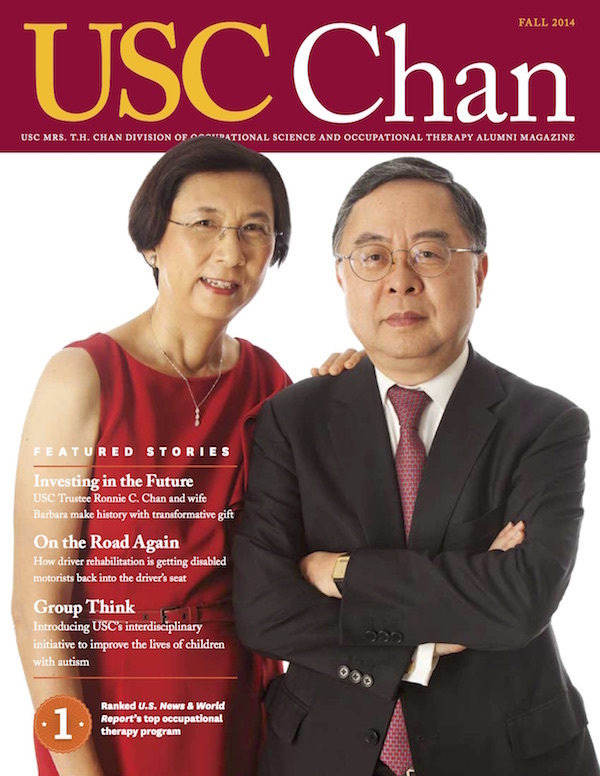 Every year, Rancho partners with the USC Chan Division of Occupational Science and Occupational Therapy, where Okada also teaches the course to candidates of the master’s in occupational therapy degree. The course, titled Adult Physical Rehabilitation Practice Immersion, allows the students to learn about the driving rehabilitation program and the assistive technologies at the Center for Applied Rehabilitation Technology. It is also in this role that he assists Okada in driver demonstrations for students and clients. Group Training. The program prepares prospective drivers with group trainings explaining the process in California for getting a driver’s license. Simulated Driving. Certified driver rehabilitation specialists work with individuals using a driving simulator to get motorists comfortable behind the wheel. Hitting the Road. The driver rehabilitation specialists assess the driver’s skills on roads around Rancho in a vehicle outfitted for a disabled driver. Taking the DMV Test. The DMV assessment includes in-person interviews as well as written and road tests and must be repeated every five years for license renewal. It can take up to six one-hour sessions to teach someone with lower-extremity paralysis from a spinal cord injury to learn to use hand controls to brake and accelarate, according to Okada.